If you are an antique automobile enthusiast, a trip to Hershey in early October is virtually a must. Antique motorcycle enthusiasts have several meets across the country where many go to buy, sell, or trade those hard to acquire vintage parts. Similar events occur at Wauseon Ohio, Rhinebeck New York, and Oley Pennsylvania but Davenport Iowa is the grand daddy and by far the largest. It is considered the "Hershey of Motorcycle meets" These bike shows are really a lot of fun and enjoyable not only because it is a time to hang out with your other antique biker buddies but also because of the relaxed atmosphere that looms throuout these events. Unlike the Hershey Nazi's that patrol the AACA meet, security is very relaxed at these bike shows and one can enjoy a cold one at will and the occasional aroma of a good joint can frequently be detected. This year we enjoyed free motorhome parking, free admission and three dollar hamburgers. On Friday, September 4th. 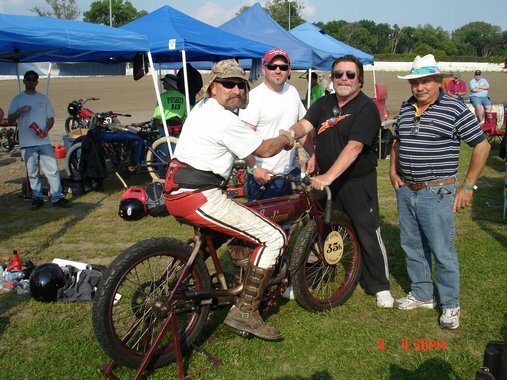 many attended the Vintage motorcycle dirt track races that are held adjacent to the meet. I purchased several vintage motorcycles and a hoard of vintage parts. It was well worth the twenty hours and twelve hundred miles each way that we had to endure. Check out some of the photos that I took at this years meet.